Rate this Article Roblox is a sandbox MMO game that’s been around for quite a while now and over the years it has seen countless improvements which have lead to a pretty substantial increase in its player-base with the passage of time. The reason Roblox has been so successful is that the game lets players be free with their creativity and express it within the game through their beautiful creations and in this article we’re going to be looking at a few of these creations by some talented users. 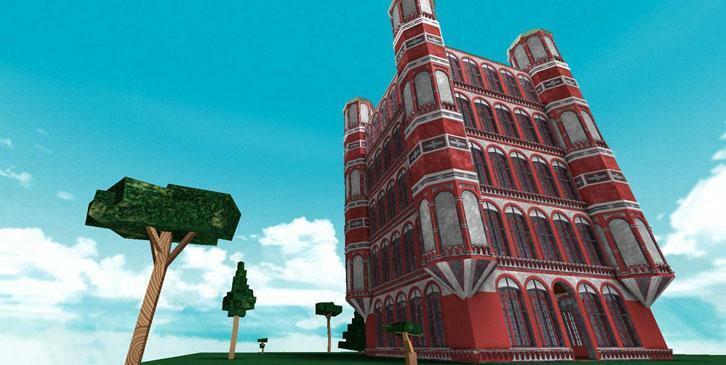 The reasons that make these 5 Roblox creations stand-out from the remaining are quite a few. Clearly a lot of time and effort has went into making them as they are pretty much perfect to the final detail and on top of this they’re all unique designs that stand out from the crowd of generic houses and structures. Victorian Gothic is an incredibly elegant looking structure that pretty much catches the attention of anyone that looks at it and makes that person admire the elegance of this creation. The structure is pretty big as compared to the rest which obviously means that a lot of extra work went into it and overall everything fits together incredibly well like the color scheme with the overall building design and all this is topped off with some trees alongside the structure. What makes this creation so great is the fact that the more you look into it, the more things you’ll find within it. The creation covers an enormous area and wherever you look you’ll see an enormous amount of detail. There are blips, air balloons and various smaller floating settlements surrounding the massive settlement in the centre that consists of great looking building and people wandering around the place. Kerrus is a simple yet impressive creation that will impress you the moment you look at it. It’s a sci-fi themed room that has a color scheme which makes it look really futuristic and the whole scene is amplified by the image of the earth, sun and the moon in the background of it all. Ruins is a beautiful creation and its beauty lies in how accurately it manages to depict actual ruins within the game. The creation consists of a stone structure with pillars where some are still holding firm, some are falling apart and some have already fallen to the ground. To bring up the visual flare of this creation there is greenery in various parts and a minor waterfall to top everything off. There’s not much to say about this creation as it pretty much speaks for itself by showing players a harmonious and beautiful far away land as the name already suggests. The creation is packed with detail and various objects like a bell, bridge and even some minor vegetation around the area. All the aforementioned Roblox creations looked absolutely stunning and managed to catch our eye with their incredible beauty. These are just a few of the amazing creations that you’ll find in this amazing game so do give it a try as it will let you express your creativity in a unique way.